One of my favorite tools on my old Amiga1200 was ToolsDaemon. ToolsDaemon by Nico Francois is available on Aminet here. Many people really like the AmigaOS4 docky bar, and it is a really great tool for adding menus and program selection .... but I got used to this old hack called ToolsDaemon and used it for several years on my 68k classic Amigas. 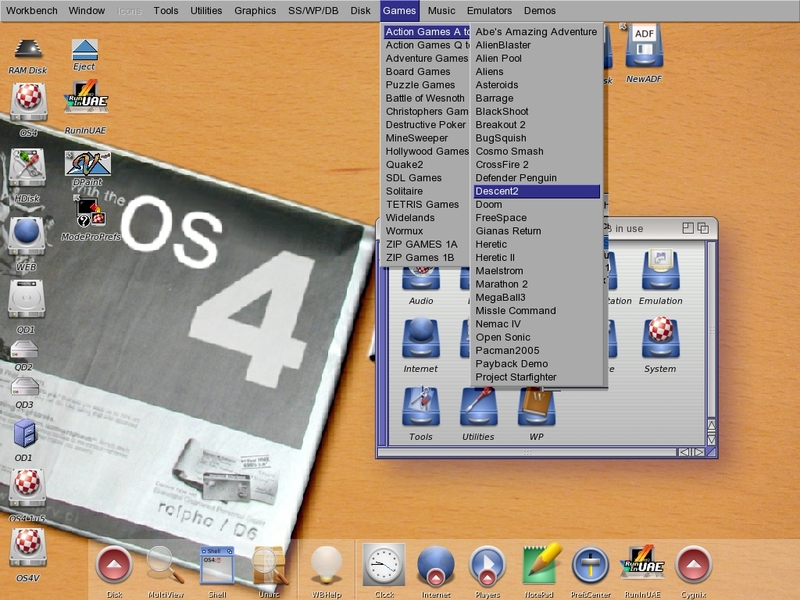 There are several advantages to ToolsDaemon over the other addmenu programs available for the AmigaOne OS4 computers. First, ToolsDaemon is a commodity that is added to your workbench startup. Second, it provides a wonderfully simple preferences configuration interface that allows you to drag and drop icons from workbench into the configuration window to add new menu items. Third, it supports as many new menu titles as you wish to add. Fourth, it allows you to have submenu items for any menu entry. Fifth, it allows you to assign shortcut keys to each menu item. Most importantly, although this is a 68k program written back in 1994, it still works wonderfully with every version of Amiga OS4 that has been released to date. Functional, but not everything we would want. As you can see, where the normal Workbench stops at the Tools menu, I have added new menus for Utilities, Graphics, SS/WP/DB, Disk, Games, Music, Emulators and Demos! As you can also see from this picture, each new menu can have as many items as can fit on your display, and each item can have subitems in the menu as well! This makes ToolsDaemon incredibly flexible and useful in helping me to organize my Workbench. The ToolsDaemon prefs tool is shown in the picture above. Note that I can click the checkbox to make certain items sub menus of other menu items. This only goes two levels deep, however. That is, you an have a menu that has an item which has a submenu. But those sub menus cannot have submenus themselves. Although such a feature would be nice, it is more than enough to have menus with submenus for me! Another great feature is that when you select Add to the commands section to add a command, a window opens into which you can drag and drop any workbench icon for any program and it's path will be automatically added to your toolsdaemon menu list. Notice that I start blitzen from CLI first (it is in my default path...sys:c). Then Dpaint is run from workbench. This feature allows me to write scripts on the fly to help get certain programs working that require special tools such as Blitzen and CIAgent to run old Amiga classic 68k programs so that once I have them added to my pulldown menus, I never have to think about it again. Simply selecting DPaint V from the pulldown will always ensure that blitzen is run first, for example. Why is that useful, you wonder? Well, suppose I decide to change all my games that are under my Action Games submenu to split them into numerous groups (which I recently had to do because I have so many AmigaOne action games now!) to that instead of having one Games/Action menu I now have two, Action A-P and Action Q-Z. Using an editor like notepad or TurboText, I can easily manipulate the ascii text menu preferences to move everything around where I wish. When I save it and restart ToolsDaemon, as long as I have kept my formatting correct, my menus will all be updated per my changes to the ascii file. Overall, ToolsDaemon is a great program to add to your AmigaOne software collection. I hope that it continues to work flawlessly with AmigaOS4.2 and beyond!